I am a performance artist, producer, and an occupational therapist of 20 years. I studied Liberal Arts at The University of Massachusetts Amherst and hold a Bachelors of Arts & Sciences Degree with Certification in Occupational Therapy (OT) from American International College in Springfield, Massachusetts 1999. As of 2018, I estimate that I have worked with over 17,750 patients. I am inspired by the work of Ai-Jen Poo (Macarthur “Genius” Fellow) who wrote The Age of Dignity - Preparing for the elder boom in a changing America and is a Co-Director of Caring Across Generations. As an OT, I am interested in working with marginalized communities and shifting the paradigm to find new solutions for aging in place. I am excited to be co-producer and merge the worlds of art and aging in an upcoming interdisciplinary/intergenerational performance called Alone/Together. I have 20 years experience in healthcare with a focus on geriatrics having worked in Acute, Home Health, Skilled Nursing, Outpatient and Mental Health settings. I have also volunteered overseas in the Dominican Republic with Partners for Rural Health , a 501c(3) nonprofit organization based in Maine that promotes access to continuous healthcare. Twice a year they serve over 2,000 patients in 15 rural villages of Dominican Republic by providing instruction in; nutrition, disease/injury prevention, dental health, ergonomics, body mechanics, and hygiene. Our team was comprised of 80 volunteers to include Doctors, Nurse Practitioners, Nurses, Osteopaths, Sport Trainers, Teachers, OT, PT, and students of Nursing and Sports Medicine (for which I supervised). Definition: Occupational Therapy (OT) is a health profession whose goal is to help people achieve independence, meaning and satisfaction in all aspects of their lives. Occupational therapy practitioners have a holistic perspective, in which the focus is on adapting the environment and/or task to fit the person, and the person is an integral part of the therapy team. As an OT, I have worked in the following settings: hospital, home health, outpatient, & skilled nursing facilities. ALONE/TOGETHER is an interdisciplinary and intergenerational performance piece consisting of three main projects which seek to engage artists and elders in beneficial processes of collaborative creativity through partnerships with established cultural and community centers. Co-Produced by Sarah Bernstein and Kelly Nesbitt with support from Susan Kocen. Please see the description of OT and photos of it's the origins below. Occupational Therapy (OT) is a health profession whose goal is to help people achieve independence, meaning and satisfaction in all aspects of their lives. OT began to emerge during the 1700's in mental health settings and insane asylums as part of the 'Moral Treatment Movement' and was promoted by Quakers. During the 'Arts and Crafts Movement' in the 1800's OT was further developed, and then officially coined in the 1917 by a team of psychiatrists, social workers, philosophers, nurses, and rehab minded construction builders. 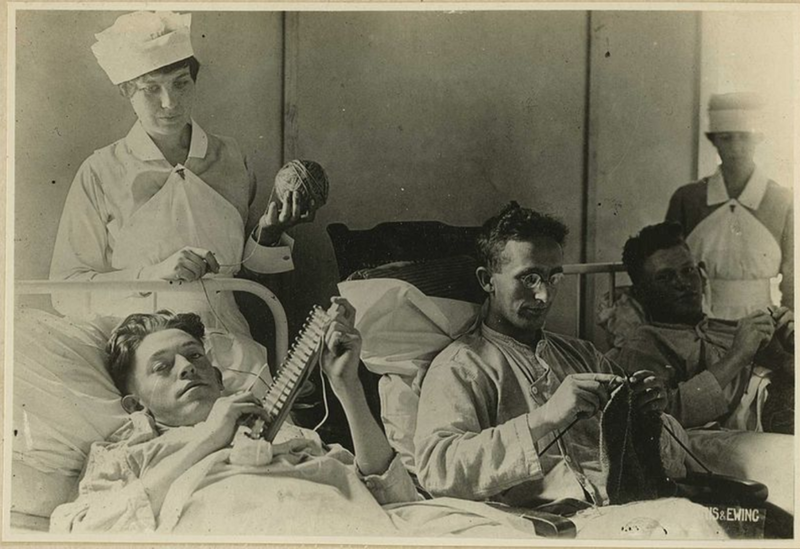 After WWI, nurses were trained as 'Reconstruction Aides' working with disabled soldiers and thus validating activity as therapy on a national level. 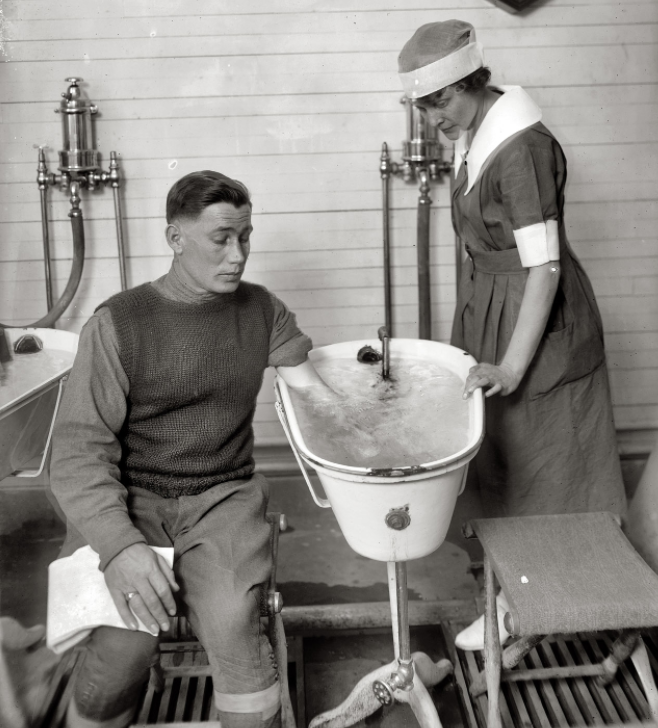 In 1918 Congress passed 'The Solider Rehabilitation Act' and soon followed by the 'Civilian Vocational Act' authorizing federal funds to rehabilitate non service members. After WWII, OT resurged and then during the 'Civil Rights Movement', OT entered the schools, public health, and continued to progress as a primary discipline in healthcare. 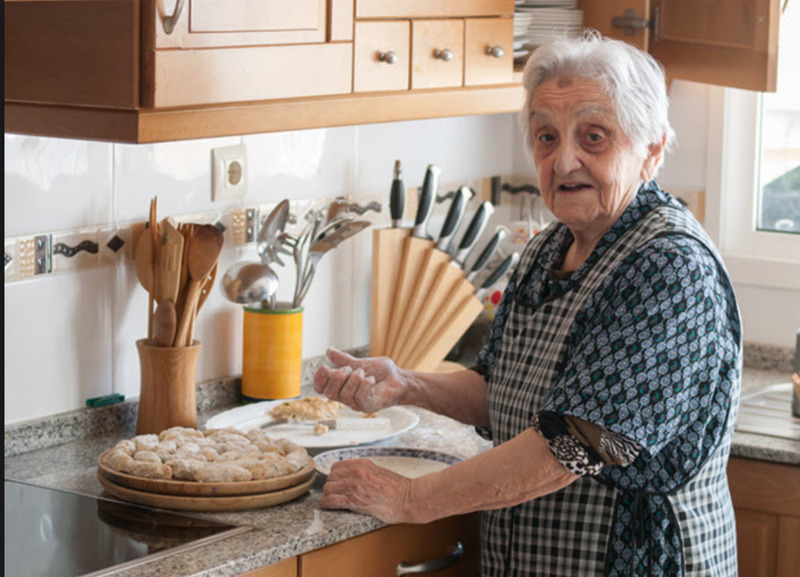 Common occupational therapy interventions include helping children with disabilities to participate fully in school and social situations, helping people recovering from injury to regain skills, and providing supports for older adults experiencing physical and cognitive changes. 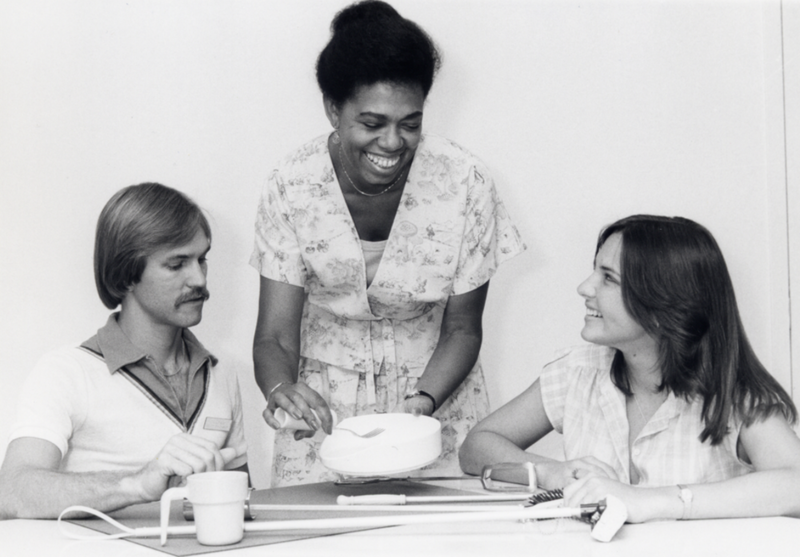 Dr. Lela Llorens, former chair of occupational therapy, demonstrates adapted equipment for people with disabilities. First Lt. Jabari Hudson, 81st Surgical Operations Squadron Occupational Therapist, makes a splint. Me with my patient in Maine. Me with the same patient in New Orleans, LA. One interesting story of mine was when I was working as a travel Occupational Therapist at Tulane Medical Center in New Orleans, there I worked with a patient in the ICU for 2 months, an elderly man from Maine (where I was from). Once stable enough he had a medical flight back to Maine. I returned to Maine around that same time, and sure enough, he ended up being a patient of mine again in a Maine rehabilitation center. Small world. (See photo above. Pt's family gave permission to use).